After forming at Davisville R.I. in December 1942, the 62nd was sent to Hueneme for advanced training. The battalion spent three weeks at Camp Rousseau, then went to San Francisco, whence it shipped out on March 24 for Pearl Harbor. 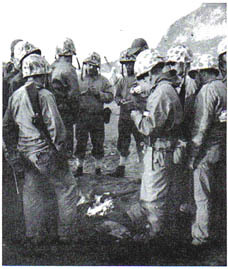 The 62nd was on duty in Oahu for 19 months, then went to Maui on November 2 for the Iwo-Jima staging. Embarkation for the invasion began on Christmas day 1944, and by February 1, 1945, the last elements of the battalion were aboard ship. 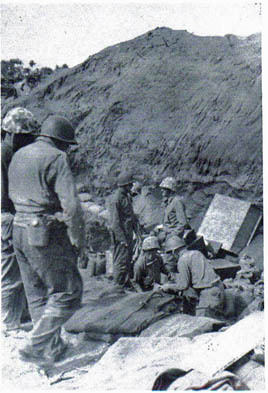 The first landing party of the 62nd hit Iwo on February 24, with the main body of the outfit coming ashore during the next three days. 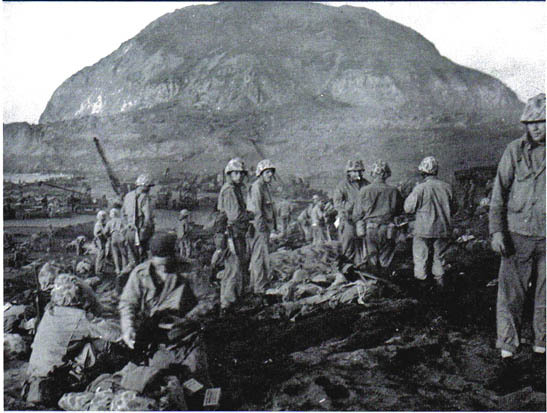 On VJ - Day, the 62nd was still on Iwo-Jima. D-Day at Iwo Jima found us aboard our three different ships, rolling awkwardly in the rough swells a few hundred yards off Red Beach. By late afternoon casualities ashore were running high as every ship present took on the injured as fast as they could be loaded into slings and hoisted aboard. We stood by quietly watching this whole show and knew it would only be a question of time before we would wade into that bloody hell ashore. 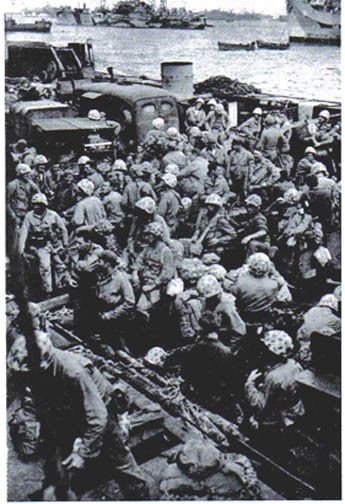 Our men on the two LST's were eating supper on D-Day, when "General Quarters" was sounded through-out the convoy. Every man of us scrambled topside in time to see that Jap Kamikaze pilots were preparing to make suicide runs. The first Jap plane roared over the top of LST No. 943, through a barrage of anti-aircraft fire, making a successful crash dive into the bow of an LST close by, starting serious fires and killed several of the crew. We had hardly righted ourselves from this first surprise, when the second Jap flew towards our LST No. 943. As his plane leveled off for the death crash, the pilot must have decidedc he was a little too high, for he pulled hard on his stick, skimmed over us at mast height. Our gunners were pouring lead into this Nip, and before he could make the last one hundred yards for his dive into the LST 884, he disintegrated into thin air. There was little time for cheering our gunners, for a third Jap plane was coming at our two LST's, and it looked like he meant to finish up this job that the first Jap had started. He was a little off our course as he came in, and selected a mine layer that was anchored starboard aft' of our ships. He crashedd midship, going through the bulkhead and into the ward room. We learned later that a number of Officers andmen had been killed as a result of this crash dive and the ship was slightly damaged. On D plus 2 the General Alarm was sounded again as a flight of Jap Bettys came in a few feet above the water. They again made several sucide hits, but the majority were knocked down by the accurate fire from our ships' antiaircraft gunners. Our group of ships again escaped unharmed. On D plus 5, LST No. 884 was the first of our group to land, hitting Green Beach at 2200. Four hours later they had completely unloaded all their equipment and dug in for their first night ashore. LST No. 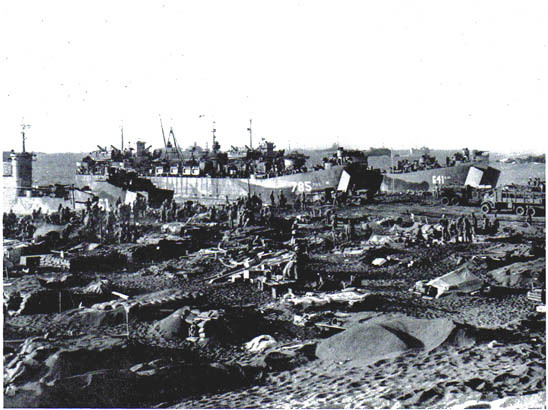 943 ground ashore on Red Beach No. 2 during the same evening but were unloading operations did not begin until daylight of D plus 6. On D plus 6, the group of APA No. 195 was tranferred to an LST and hit the beach at 1930 that evening. Unloading started immediately but it was 0200 on D plus 7 before we shouldered our packs, to make the landing. A few yards up the beach we spread out, to dig in for the night. 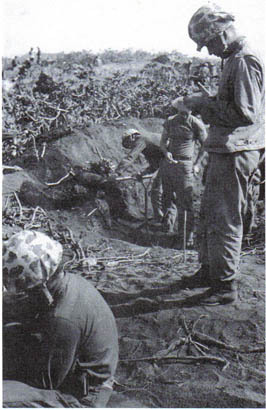 During the first hour, we dug our foxholes, everthing was quiet and we had about decided that the Japs werer afraid of Seabees, when their first volley of mortars exploded a few hundred yards above us. We lay there for the next hour, hugging volcanic ash, and watched a ferocius Jap artillery attack taht completely wiped out a large Marine fuel and ammunition dump. As the first light of day began to dawn, we got out of our shallow foxholes to get a good look at this island of Hell, and we all silently thanked God for watching over us. The dawn broke quietly our first morning on the beach of Iwo Jima, and we were still alive. Cramped and stiff we pulled ourselves out of the shallow foxholes to be greeted with scenes of incredible destruction; dive bombers screaming down out of the sky to launch their rockets on the hapless Japs and thousands of men piling the beaches high with supplies from the hundreds of ships off-shore. Evidence of the titantic struggle that has pushed forward from the beach was everywhere. Waves rolled up and crashed from the beach abandoned ships, tanks, and buffaloes, while the sea worked relentlessly on the beached Jap ships that our mighty guns had torn assunder from stem to stern. Towering above us was the famous "Hot Rock," Mt. Suribachi, a grim reminder of Japan's fading power, with Old Glory waving gently in the breeze on the highest point. We had witnessed that battle from a distance; we knew the terrific losses, our Marines had suffered capturing that Jap fortress. Our mediations were broken up by the command to shoulder our packs. We slogged along through volcanic ash reeking with the smell of death, up off the beach, over the ridge and past Airstrip Number One to our assigned bivouac area. It was a debris-littered bomb -packed patch of no-man's land we had acquired. We spread out and began to dig our fox holes with the shell craters giving the lucky ones that reached them first a head start. Discarded shell cases, cartridge boxes, Jap fence posts and any scrap meterial available, were all collected and put to use in the building of our foxhole shelters. It wa a rush job in order that we could be below ground with a cover overhead before the eerie black night surrounded us. 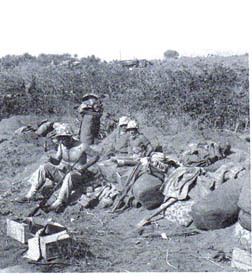 The Marines had set up their artillery in and around our camp and they kept a barrage of projectiles hurtling over our heads day and night. During a period of twenty days, one gun alone (of the dozen or so located in our area) fired over three thousand rounds of steel at the Japs in the forward lines. Fresh water was a problem from the time we landed. The water distillation crews set up their equipment in record time, but there were a lot of men and at first we were rationed to one canteen per man a day. We ate the famous "K" rations for the first few days, but none of us gained any weight on those dainty morsels. A cup of hot coffee was more welcomed than a T-bone steak and when the ten-in-one rations were issued we cooked our meals in hobo fashion, ten to the pot. It was twelve days before our first crude shower was set up and we were a dirty lot. Temporary galleys were set up that improved the chow situation and the first loaf of bread from the bakery was fondly re-named "angel food cake." Our heavy old helmet that we had wanted to throw away many times took on a new importance. It was better than an entrenching tool for digging a foxhole, it was our cooking pot, wash basin, laundry tub and bath tub and was indispensable in the foxholes at night as a deluxe bed pan, when you took your life in your hands if you stuck your head above ground. Our heavy equipment men began work on Number One Airfield the day we landed, before the full length of the strip had been secured by the Marines. 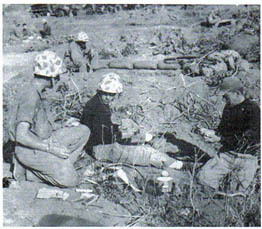 Our men fought off banzai attacks, ducked from sniper's bullets and ran for cover every time the Nip mortars got a bead on our equipment, but pushed on with their work day and night. Seven days after the repair and construction of the airfield had started, a cripled Super-fort on the way home from a bombing mission over Japan made an emergency landing...Our fellows deserve a lot more credit than they have received for t he fine job they did during those danger filled hours. In fact, it was a rough, tough period for all of us, but we came out of the mess better equipped to meet the action-packed days ahead. our bed pal at night...The idiot stick was in general use at all times. our papers and cans just like they taught us to at Jungle Training. Original Story submitted 28 January 2005.